This elegant salad tastes wonderful The combination of salty and sweet with the asparagus is really heavenly. Presented in this manner it would make a lovely holiday meal. Chop the nuts in rather large pieces and toast in a dry frying pan. Stir to make sure they do not burn. It will only take a coupe of moments. Remove the walnuts from the frying pan and allow to cool. Bring a pot of lightly salted water to boil. If using fresh white asparagus, peel, then slice carefully lengthwise. If using green asparagus it is not necessary to peel. If the asparagus is “pencil thin”, the slice on the diagonal. If they are large, then you can slice them lengthwise also. Place the asparagus in the pot and cook until al dente. Plunge the cooked asparagus into cold water to stop the cooking process and allow the asparagus to cool. Carefully remove the pits from the dates and slice lengthwise. We cut them in halves. Season the dressing to taste with a pinch of salt. Clean the lettuce leaves and arrange on individual plates. Arrange the asparagus on the lettuce. Add the date pieces here and there. Sprinkle the walnuts over the salad. And grate some soy cheese on top. And grate fresh pepper over the top. Serve the salad with the dressing drizzled over the top. You can use either green or white asparagus for the recipe. 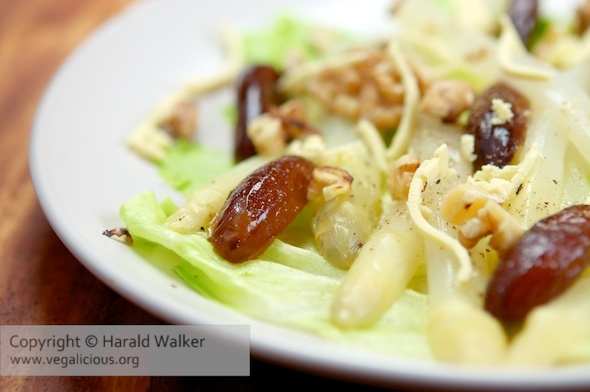 Posted by Chris Walker on November 24, 2010 in Asparagus, Salads, Soy cheese, Walnut.